SOUTH BEND, Ind. (AP) — His coach called Juwan Durham’s performance Tuesday night the 6-foot-11 sophomore’s “coming-out party,” but Durham said it was more about circumstance than any particular corner he’s suddenly turned in his development. Trent Frazier’s 24-foot, solid-look 3-point try for Illinois narrowly rimmed out just before time expired. Durham, who sat out last season after transferring from Connecticut, registered a career high for points. Harvey’s total was also a career high and Gibbs’ a season high. 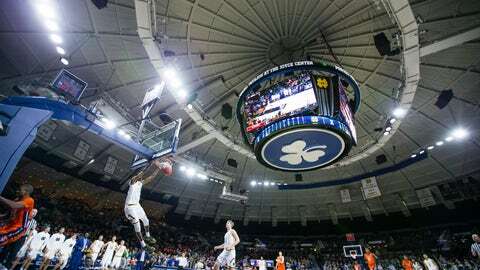 “He was fabulous,” Brey said of Durham, who did his second-half damage in 12 minutes. Most of it was after Mooney, ND’s second-leading scorer on the season, fouled out with 9:19 to go. Illinois: In the lone true road test on their nonconference schedule (excludes neutral-site matchups), the Illini continued to show their futility away from Champaign over the last few years. They’ve not won a true nonleague road game since a 2014 NIT first-rounder — dropping eight straight since — and they were 1-8 in Big Ten road games last season. Illini freshman Tevian Jones has been suspended indefinitely from game competition for a violation of team rules, Underwood announced before Tuesday’s contest. The 6-foot-7 Jones, a four-star recruit from Culver City, California, was averaging 3.2 points, 1.7 rebounds and nine minutes while appearing in each of Illinois’ first six games. Carmody went into the night averaging 5.5 points and 13.5 minutes per outing. Brey said he expects the swingman to be back for ND’s next practice Thursday.